You wish to see where will be conducted the current forestry operations this year? The goal of the interactive map is to make available information related to different versions of the Operational Integrated Forest Management Plan (PAFI). 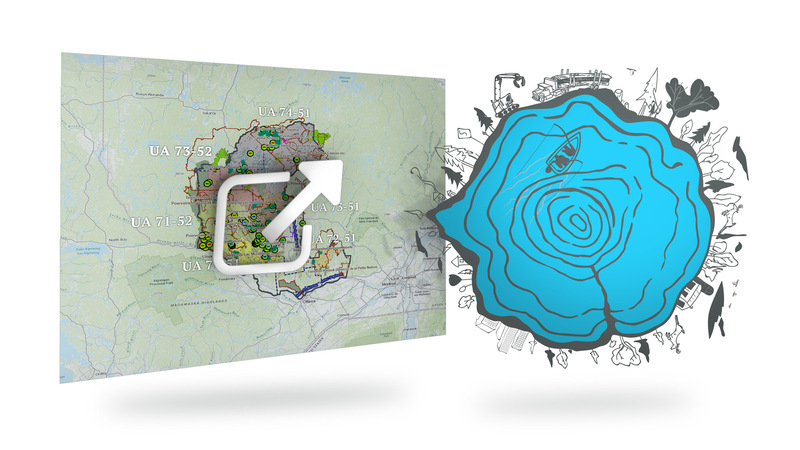 In the map application you will find a wealth of information on the forest, wildlife and land that is public domain in the Outaouais. Go to the page Calendar of the forestry operations and use the Search by forestry operation area tool. You will be able to check if any forestry operations will be conducted in the coming weeks. In this case, you must first consult the Interactive map. But before you launch the application, take a few minutes to read carefully the User’s Guide. This will enhance your experience with the web mapping application and it will help you to find what you are looking for. Once you’ve launched the application, localize yourself using visual elements of the map or use the Search tool in the top left corner of the window. Use the Zoom tool to get closer.. When you find your site of interest (a lake, a cottage, a canoe circuit, a VTT trail, etc. ), see if there are any polygons from the Programme annuelle (PRAN) com layer or the PRAN non commercial layer. If polygons of either layer are visible on the screen near your site of interest, you can click with your mouse on a polygon. A small pop up window will open in which you will find the name of the forestry operation area. Go back on the main website and go to the page Calendar of the forestry operations. You can now use the Search by forestry operation area tool. Please note that some layers of information have undergone geomatic processing to optimize display. PLEASE NOTE that the data contained in the interactive map tool is not legally binding. What navigators work best with the interactive map?